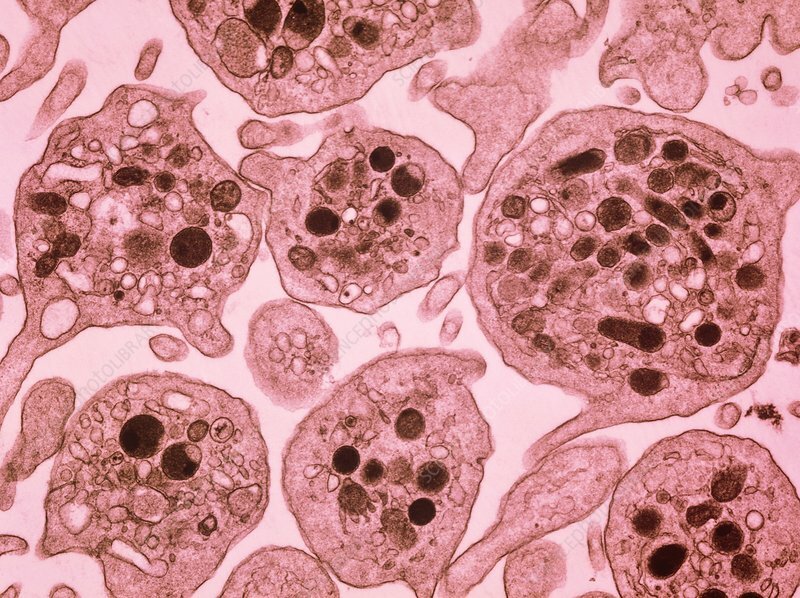 False colour transmission electron micrograph of a section through activated blood platelets. Platelets (thrombocytes) are formed in the bone marrow, and circulate in blood in large numbers. In an unactivated state they are round/oval, whereas activated platelets develop pseudopodia, or extensions from the cell walls. Platelets contain cytoplasmic organelles such as mitochondria (small grey bodies), endoplasmic reticulum & granules (dark stain). Platelets function in 2 ways; they plug defects in the walls of capillaries & also are involved in clott- ing. They also release serotonin, a blood vessel constrictor substance. Mag: x22,000 at 6x7cm size.